Buffer is an effective tool to manage more than one social media accounts through a single dashboard. You can also create posts and schedule them for future uploads. The feature of auto publishing helps to publish content as and when relevant. 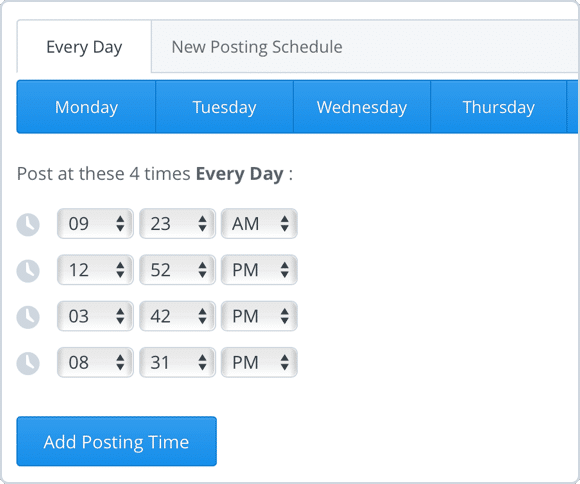 One added feature of Buffer helps you to create a queue of posts and uploads them according to the schedule set by you. Buffer converts the number of likes, shares, comments tweets and other reactions of your post into numerical value which helps you to measure your post’s popularity on different social media platforms. Buffer also provides free trial which allows you to judge whether all your needs are being fulfilled or not. How much does Buffer cost ? The pricing for Buffer starts at $0.0. Buffer has 5 different plans such as - Starter Plans Free at $0.0, Starter Plans Pro at $15.0 per month, Business Plans Small at $99.0 per user per month, Business Plan Medium at $199.0 per user per month and Business Plans Large at $399.0 per user per month. Pros: Buffer has gone through some changes since I first started using it back in 2015, whenever I would need to manage several accounts at a time or would have to leave my job for a few days I would turn to the most reliable app to make sure my posts across several social media were up on time. Cons: I recently decided to switch to a different software since Instagram has gained more importance for several brands I work with, Buffer does not allow for auto posting on Instagram which is a disadvantage on busy days when I'm relying on it to get my posts up on time without me having to worry about it. Pros: Using a queue to organize thoughts and content reduces loads of stress and allows you to focus your creative energy on creative thoughts rather than mindless protocol like scheduling your promotion. Cons: The only problem with the queue relates to changing the order of content. For example, if you want a specific piece of content to go live every Monday at 6:00, you'll run into a problem based on how many posts are queued prior or after your desired date and time. Great software, even better support! Pros: Really easy to use to schedule social media content, especially adding to a queue without having to set a specific posting time. Cons: If you only want a few accounts, but go beyond the free account limits, it's quite pricey for what it is. However, if you use it regularly, it's absolutely worth the cost. Overall: The customer support team at Buffer are the best - on the odd occasions the software hasn't 100% lived up to expectations, they've been so helpful! Awesome social tool for productivity! 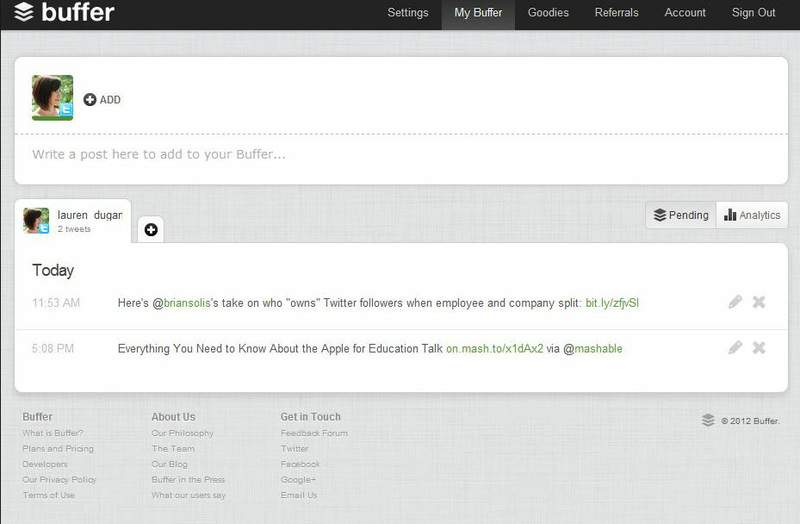 Pros: We love how easy Buffer is to use. We also love how you can integrate it with various social networks and post to multiple networks simultaneously. Cons: I don't think there is anything we don't like about Buffer. Overall: We've been using Buffer for 2+ years and we still love it ! Awesome tool. Cons: - I have zero complaints about this product. It does what it should in a simple and easy manner without any fluff. 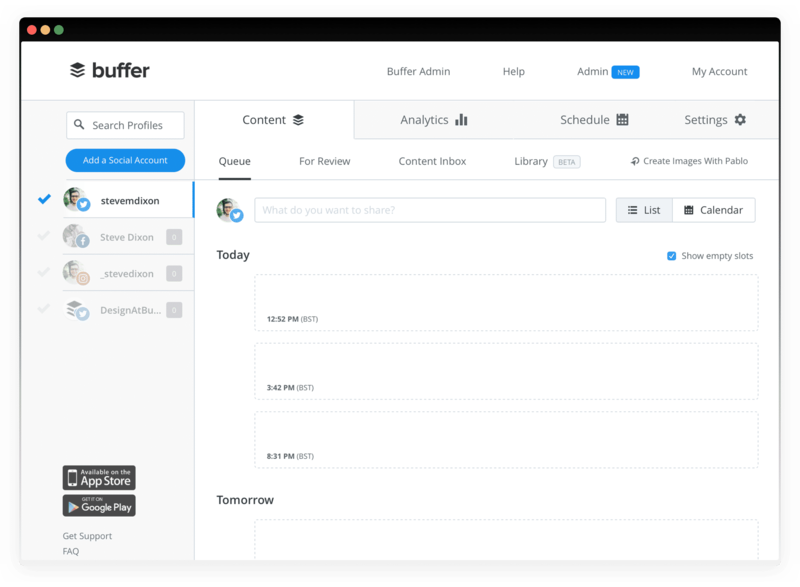 Overall: Buffer is my go-to product for social scheduling. 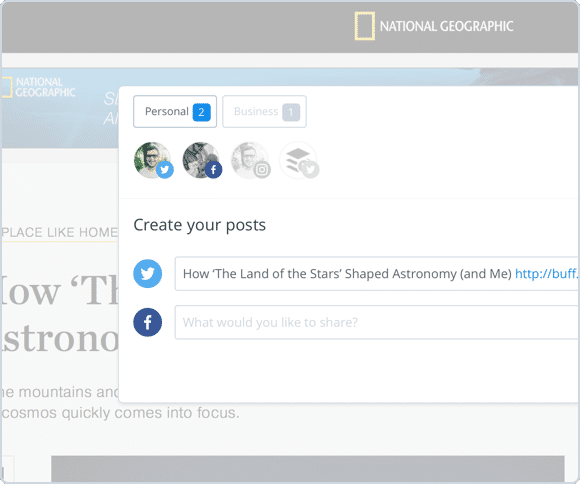 It covers every popular platform and really saves you time when building your social audience. 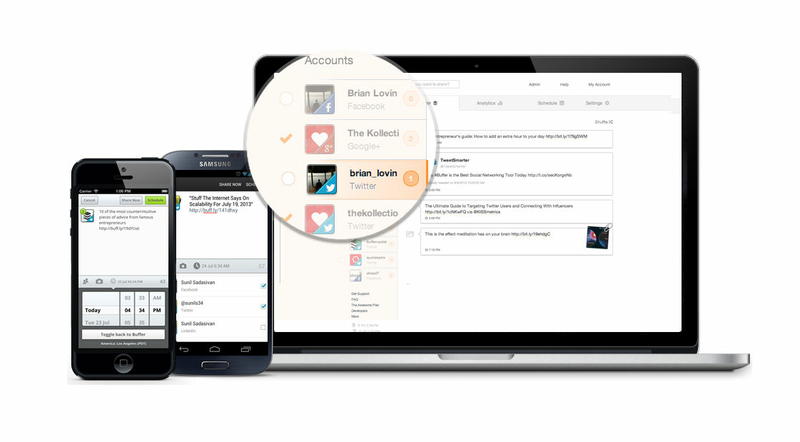 Pros: Easy to use social media management for free with up to 3 platforms. Overall: If you need to manage your social media this is the best free app to do it! Pros: This program was so easy to learn and use right away. Cons: Price jump from one level to the next was too big a jump but we am still getting value out of the software. Overall: This easy to use platform is scalable and allows us a ton of control over what we want to do with our social media. Pros: I love Buffer schedule feature. It really works well. Having to manage so many social accounts spreaded over so many clients can be confusing to manage. Fortunatelly makes this process much soother integrating/publishing those social accounts making it a all in one" tool"
Cons: I believe pricing is a bit on the high side. I still believe its a very valuable and worthy tool, but when you manage multiple users it can become expensive. 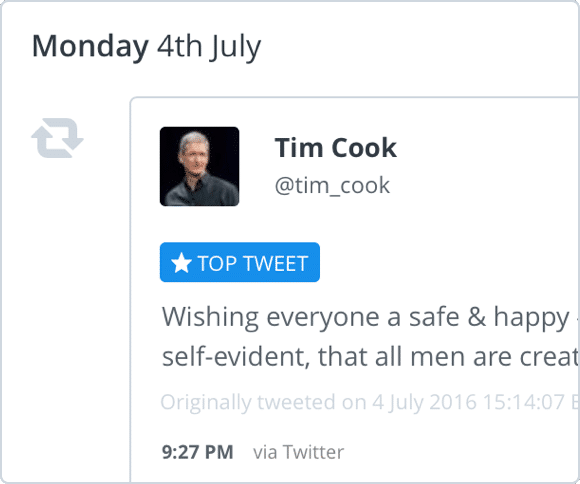 Overall: Basically, its a great way to rationalise your social media workflow with integrated and scheduled tasks. It saves a lot of time allowing buffer to "work for me" posting all i need and when i need to my clients social media platforms. Pros: Buffer is a great alternative to Hootsuite. It is very simple and user friendly. Cons: Compared to Hootsuite, it doesn't give as many features. Pros: its a one stop shop to manage, schedule and analyse the performance of all the social media sites and even Instagram now has direct scheduling and not just the remainder type notification which appears in your native Instagram app so you can post from your mobile. 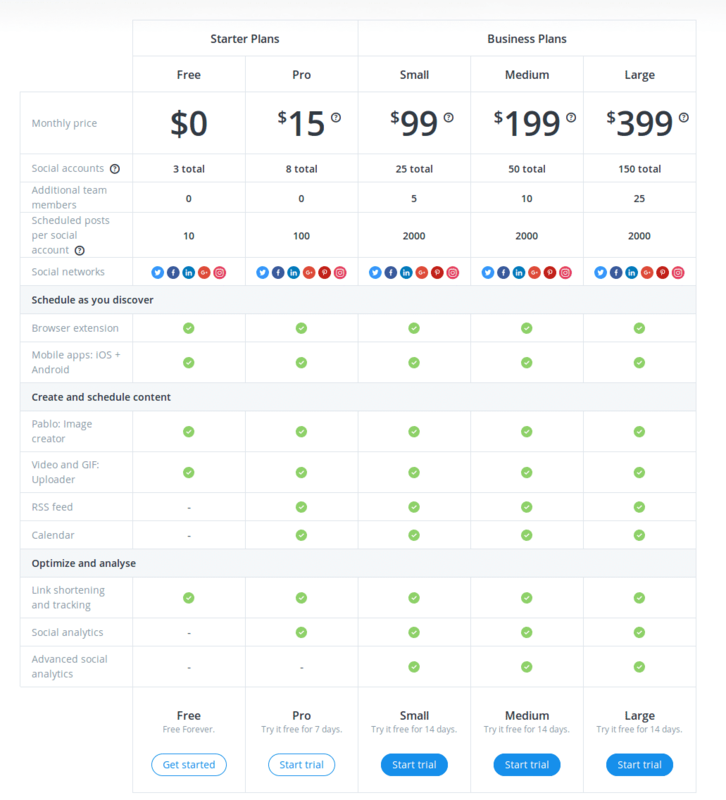 Cons: The number of social accounts at 8 for the pro and premium pricing plans are rather low compared to the small business and medium bump up to 25 and 50 respectively.